Big, shiny, copper, or small – you are still worth it all. It makes “cents” to know your worth! Little Copper Penny is sad because all the other coins say pennies are worthless. Luckily Grandpa Wheat-who has been around for a very long time-knows just how Little Copper Penny feels and exactly what to say to cheer him up! A charming story about accepting who you are, Stephenie Barker’s The Little Copper Penny not only makes counting fun but also reminds you to know your worth, no matter what others say. Join Little Copper Penny and Grandpa Wheat for a memorable rhyme that will help you see that no matter who (or what) you are, you have value! About: The Little Copper Penny is a children’s picture book written by Stephenie Barker and illustrated by Cynthia Meadows. It will be published on 4/1/2017 by Brown Books Kids, a division of Brown Books Publishing Group, hardcover, 32 pages. The genres are fiction, money concept, and picture book. This book is intended for children ages 3 to 8. According to Brown Books Publishing Group’s website, they are a full-service, independent publisher of high-quality books of all genres, committing to providing illustrated book that breathes life into the story filled with entertainment and lasting memories for generations of readers. Please see below for more info about the author. My Experience: I started reading The Little Copper Penny on 3/6/17 as a bedtime story for my 5 year-old son and we finished it that same night. We read it again on 3/9/17. My son likes this book. 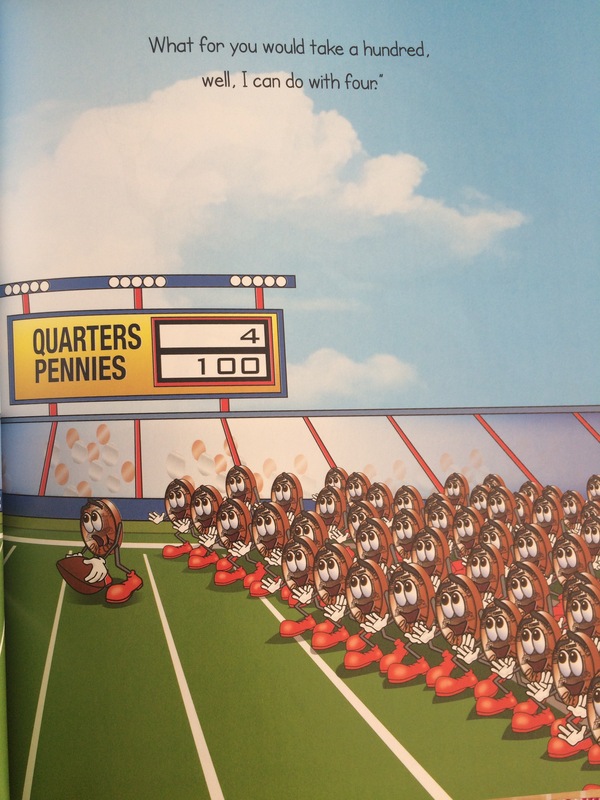 He likes to collect coins for his piggy bank so this book makes it a great read! In this book, readers will follow the little copper penny and his insecurity about being valued so much less than other coins. Grandpa Wheat is wise because he’s dated in 1922. Grandpa went on to explain that penny can count all the numbers whereas nickel can only counts by 5s and dime can only counts by 10s. The pictures above are great because it demonstrates 25 pennies to equal one quarter and 100 pennies to equal 4 quarters. The illustrations in this book is very upbeat. We like the sports themed with the race to the finish line, soccer and the football field. My son likes how the small coins gets lost in sofa cushions. I like the pink piggy bank in this book. This book could have been better if it gives examples about spending money, saving money, or little ways for kids to earn money. I do like the size comparison in dime vs nickel vs penny and in number where 10 pennies to make a dime. I like the show of how a quarter cannot count to sweet 16. This book is a fun introduction to money and to accept as who you are for kids and I highly recommend the read! I rate it 4.5 stars! Stephenie Barker has been teaching her children the value of planning and saving money since they were very young and imparting strong principles and life guidelines to them. With The Little Copper Penny, Stephenie hopes to do the same for children everywhere and show young minds the value and importance of every little cent. She is also proud and overjoyed to see children taking a greater message away from her book: that every thing and every person has value, no matter how big or small they may be. (Info obtained from Edelweiss. Do click on the link on the author’s name to visit her website to learn more about her and the illustrator). ***Disclaimer: Many thanks to Brown Books Kids for the opportunity to read and review. Please be assured that my opinions are honest. What a cute premise. 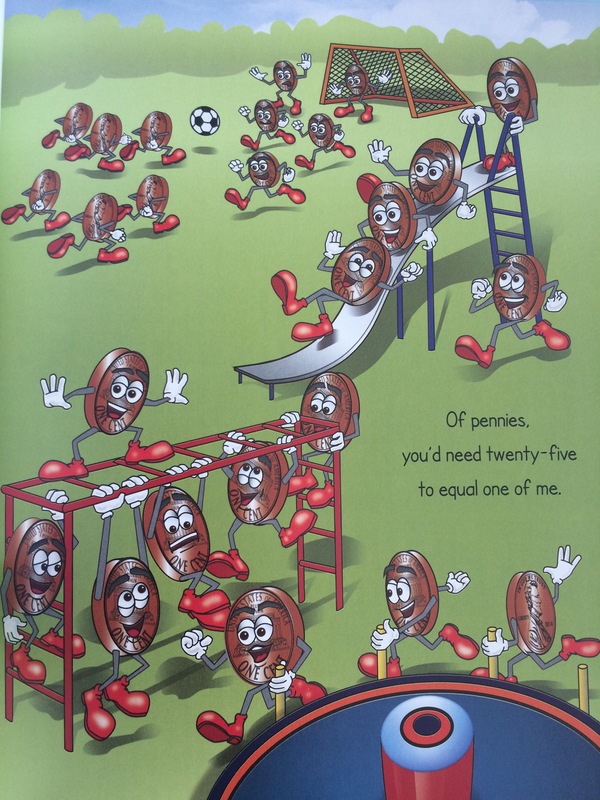 I love the idea of showing how the pennies equate into other coin values. I think this is a great opportunity for a series. I wonder if there will be more of these books?